Believe me when I tell you that this turkey roulade is some next level food. And this is coming from someone who could give or take the turkey every Thanksgiving and Christmas. It’s juicy, tender and straight up de-licious. It also cooks much faster than your average turkey roast since we’re just dealing with the boneless, white meat here. 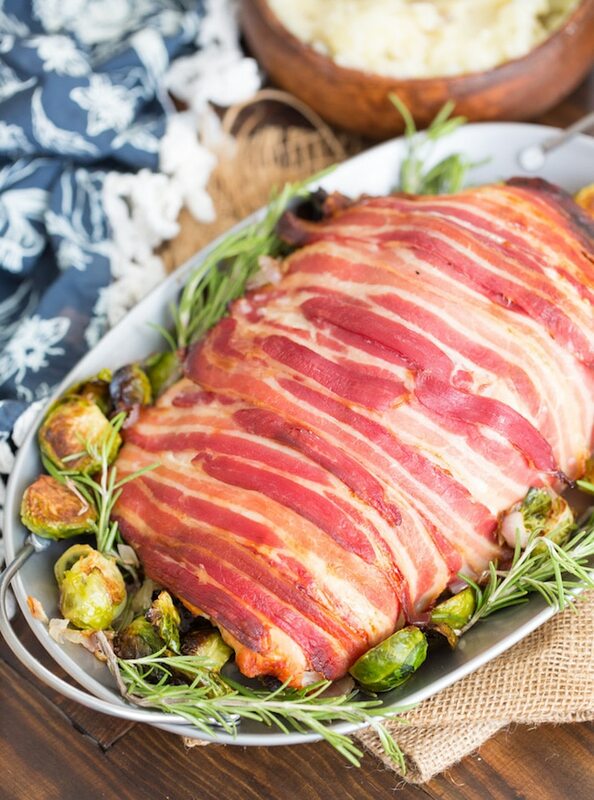 If you’re looking for a new Thanksgiving or Christmas main or you need to feed a smaller crowd than this bacon wrapped roulade is just what you need! This turkey is a little more involved than you might be used to but it’s much easier than it looks. The process here can be broken up into two parts: the stuffing and the turkey. 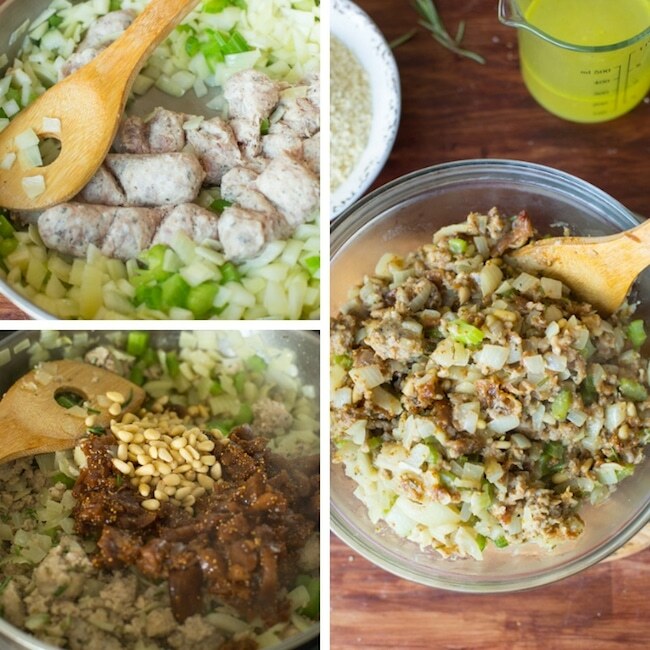 The stuffing itself is very easy to make. It’s just a matter of chopping, cooking and mixing. Super easy and pretty fast. Start out by add the figs and wine to a small pot. Let that mixture cook and reduce down for about 5-10 minutes. While that’s simmering on the stove you can start chopping your vegetables. Dice up your onion and celery and then sauté those in a large skillet with some olive oil for about 5ish minutes. Add the sausage to the pan and break it up into crumbled bits. After about 10 minutes add the wine-fig mixture to the sausage mixture along with the rosemary and pine nuts. Mix well and cook as your kitchen begins to smell more and more like actual heaven. Transfer the sausage mixture to a large bowl and add the breadcrumbs, chicken stock, salt and pepper. Mix well and try not to eat too much stuffing. When you buy your turkey it’s likely going to come as one large breast. 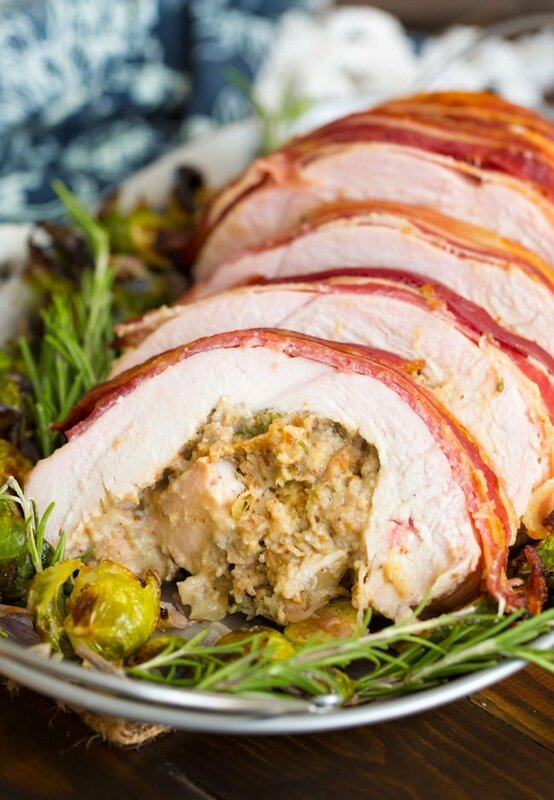 In order to create the roulade you’ll need to ‘buttery-fly’ your turkey to flatten it out. If you’re not sure how to do this I highly recommend watching this how-to video by Martha Stewart. That video will give a verbal step-by-step along with visuals showing how it’s done. Essentially you need to cut the turkey in half crosswise so that the breast opens up like a book or a butterfly. Make sure not to cut the breast fully in half because you want this to be one large piece. After you’ve cut it up, cover with a piece of foil or plastic wrap and pound the the breast with a meat mallet or something heavy like a rolling pin. Pounding the meat makes for a more even and tender breast. It will be easier to roll and juicier in the end. When you’re to assemble, spread your stuffing mixture over the top of the turkey. Make sure not to pile it up too high and leave about 1/2 inch around all the edges to minimise the spillage. Beginning at the shorter end of the turkey, begin rolling the breast like you would with a jelly roll or cinnamon rolls. Roll until you have a thick log and place the breast seam side down. Secure the turkey with tooth picks to hold it in place. You will end up with extra stuffing. Add it to a greased baking dish and set aside. Bake the remaining stuffing during the last 45 minutes of the roast. Finally, take your bacon slices and lay them over the top of the roll. Overlap the bacon as the bacon will shrivel up slightly as it cooks. Place in the oven and roast about 2 hours or until the turkey is cooked through. 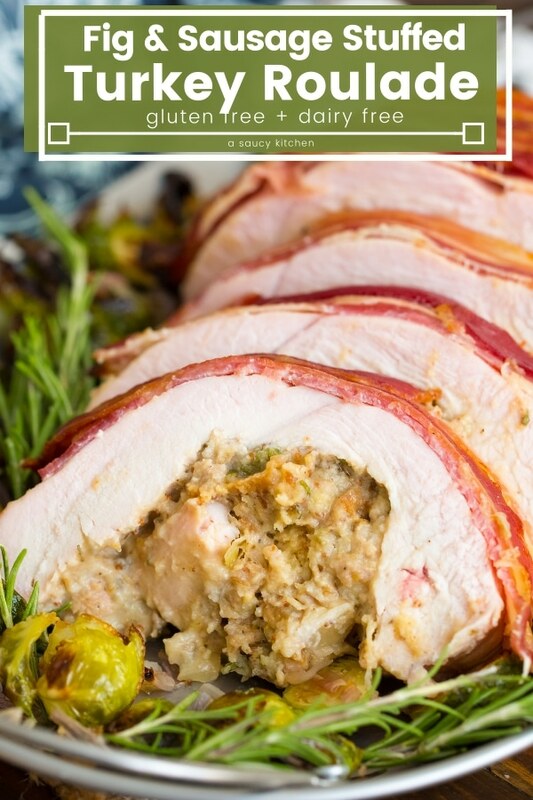 This turkey roulade is adapted from one originally shared by Ina Garten (so you know it should be good from the start). If you need to feed a small crowd or you’re bored of your standard roast turkey this roulade is a great option to add your Holiday menu. As someone who usually can’t be bothered with Thanksgiving day turkey – I like to keep myself occupied somewhere between the mashed and the bread basket – this has become one of my favourite things to eat and make these past few years we’ve had it. 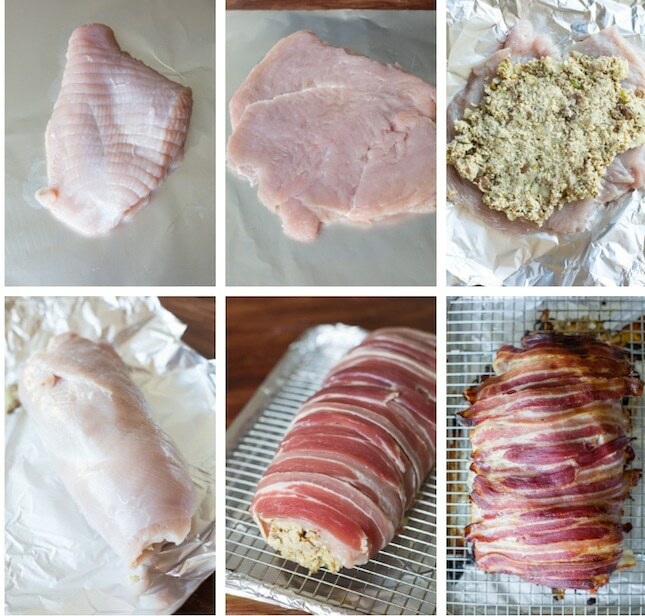 Don’t forget to #asaucykitchen on instagram if you this Bacon Wrapped Turkey Roulade! I love seeing what you make! You can also post your pictures to my facebook page! Add the figs and wine to a small sauce pot and cook over a medium heat. Bring to a boil and then reduce down to a simmer for 3-4 minutes. Let the mixture reduce down almost completely before taking it off the heat. Set aside. In a large skillet add the olive oil, onions and celery. Cook about 5 minutes until the onions become soft. Add the sausage, breaking it up with a wooden spoon. Cook until browned, about 10 minutes. Stir often to keep from burning. Add the figs, rosemary and pine nuts to the pan and cook another couple of minutes. Transfer the sausage mixture to a large mixture bowl. Add the breadcrumbs, chicken stock, egg salt and pepper and mixture. Mix well. Preheat oven to 325°F/ 160°C. Place a baking rack on a sheet pan. Lay the butterflied turkey breast on a cutting board. Sprinkle the surface of the meat with salt and pepper. Spread the stuffing in a 1/2-inch-thick layer over the top of the meat. Make sure to leave half-inch border around all sides. Press the stuffing down into the meat - if it's too high it will be difficult to roll. You will have leftover stuffing - add it to a greased baking dish and bake for the last 45 minutes of the roast. Starting at the short end, roll the turkey up as you would do with a jelly roll or cinnamon rolls. Roll tightly. Secure with toothpicks or cooking twine. Place the turkey roll seam side down on the racked baking sheet. Lay the bacon slices crosswise over the turkey roll - overlap the slices slightly. Tuck the ends under the turkey and continue until the roll is covered in bacon. Place in the middle of the oven and roast for 1 hour 45 minutes to 2 hours until the internal temperature reaches 165°F/74°C. Let rest 15 minutes before slicing into 2 inch slices and serve with more stuffing on the side. The stuffing can be made 1-2 days in advance. Store in an airtight container in the fridge until needed.